OK, you've heard about Steven Slater, the JetBlue flight attendant who had a major workplace meltdown last week. It was a classic "take this job and shove it" moment. And, sure, maybe he shouldn't have done what he did, but did you catch yourself thinking, "I know exactly how he feels"? If so, you have a lot of company. It's tough out there. Even if you like your job, even if you are grateful just to have a job nowadays, you probably get stressed out from time to time. It's normal. But wait. Print out this list now, and on those days when it all feels like just too much, check out these tips before you do anything rash. --Don't promise what you can't deliver. --Learn to manage your emotions, instead of letting them control you. --Cultivate a sense of humor. --Resist micromanaging (of yourself and others). --Get the sleep you need. --Try getting to work 10-15 minutes early. --Take a walk at lunch, or do some stretching exercises, or jumping jacks, or something. --Don't skip breakfast or lunch. --Learn to recognize symptoms of stress (anxiety, headache, anger) so you can nip it in the bud. --Make some friends/allies at work. --Talk about your stress, to somebody. --Pay attention to your breathing; slow it down, deepen it. --Post family photos (or other images that make you happy) in your workspace. --Focus on the now (i.e., don't agonize over the past, don't fret over the future). --Find harmless ways to vent; e.g., cry, or punch a pillow. --Remind yourself of what's really important in life. --Beef up your skills; become better and faster at what you do. --Make sure you truly know what is expected of you (you may need to talk to your boss). --Try looking at situations from different points of view. --Seek work that suits your personality. --Always have a fallback plan (a "Plan B"). --Make your workspace as ergonomic as you can. --Wear clothes that are comfortable and that you look good in. --Learn to manage your boss. --Avoid negative people as much as you can. --Write down the things you like about your job. --Make a list of all your achievements in the last year. --Get clear on your life goals and take a step, no matter how small, toward those goals every day. --Learn to love yourself as you are. --Put a smile on your face. --Get a hobby that makes you happy. --Learn to prioritize. Learn to delegate. --Stop comparing yourself to others. --Ask for help when you need it. --Break big jobs into bite-size pieces. --Know your limitations and let others know them too. --Don't try to control what is uncontrollable. No one likes a whiner. That may be why we keep our mouths shut and eat the $25 entrée cold, pay the bill we don't owe, or put up with the plaid suit our partner pulls out of the closet for yet another wedding. It's not that complaining is wrong, it's just that there's a right way to do it. A few key phrases can turn your position of underdog into top dog, without so much as a raised eyebrow. The website Jezebel recently posted helpful advice from expert complainers on how to gripe effectively. But what about the people who field the complaints? The poor souls who serve as sounding boards know the difference between a tantrum and a genuine problem. Only one is solvable. However common or complicated the situation, speaking up can make all the difference. But first you need to know how to be heard. 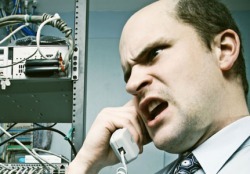 The complaint: "My cable company is overcharging but no one will listen to me." No one fields more complaints than these folks. Their website serves as a directory for customer reviews and also plays middleman between the little guy and businesses both big and small. "We field a lot complaints from individuals about their cable and phone companies," says Southwick. "They've already gone through the company's customer service channels and haven't been helped. Bureaucratic issues --"I can't authorize that and the person who can is away"--can make your complaint seem fruitless. So the next step is hitting up theBetter Business Bureau (not just screaming at a helpless phone company employee). They have a 73 percent success rate in solving customer complaints through mediation. And with a million requests pouring in each year, their employees have learned to identify which complaints will have the best shot at getting resolved. Probably the number one piece of advice? Get specific. Detailed information about the origin of your complaint, from dates to contacts, will garner results faster. "As you outline your complaint, step by step, include as much specific information as you can," says Southwick. "A customer ID number, any evidence of communication with the company, dates of requests, names of people you spoke with. All these little details will expedite your request quicker." That's the case whether you're contacting the company directly or going through the BBB. Another angle is to send a letter to the big cheese of the company's worldwide headquarters. "We've seen people write letters to heads of major companies and sometimes it works." Remember, flattery will get you everywhere. "Be sure to mention how long you've been a loyal customer, why you value the company, and provide a detailed breakdown of your complaint, with copies of your evidence." The complaint: "I don't like my haircut but I can't explain why." As a veteran of London and New York salons for 10 years, Benson rarely fields complaints she can't fix. Unless someone's having a meltdown. "When clients are breaking down, crying and pulling on their hair, there's a communication breakdown and at that point, nothing will satisfy them," says Benson, a stylist at Arrojo Studio in Manhattan. But for those who hold back the tears, a quick fix is usually easy. The best thing to do is to explain exactly what you don't like about your hair. But that's not always as easy as it sounds. If your explanation is something like "it's just blah," it's time for plan B. Benson suggests offering up some personal background information. Giving the stylist a window into your work attire, your family life, and even the amount of time you devote to primping, will help her interpret your complaint. "I've had clients tell me they want a 'funkier' cut, but then they tell me they wear a suit to an office," says Benson. "That kind of information gives me a get a better shot at giving them what they want." But the truth is, a picture says a thousand words. Three or four say even more. If you're unhappy with your cut and you're at the salon, defer to their magazine rack. Benson recommends taking a few minutes to flip through their fashion rags in search of a visual explanation. Or pull up a few photos from a fashion blog on your iPhone before your stylist pulls out the scissors for a second time. But whatever you do, avoid the hairstyling magazines at the salon. "Their looks can be over-processed and unrealistic," says Benson. If you're still unsatisfied, try to identify your styling process and what about it isn't working for you. "Is the top of your hair not laying right? Are you having trouble drying it? That kind of detail actually explains a lot more than you might realize," Benson explains. The complaint: "My boss is really hard to work for." So you're over-worked, under-appreciated, and at the mercy of an office tyrant who isn't known for his communication skills. Don't quit yet. Adolf, founder of her own HR consulting firm (Barbara Adolf Consulting), has seen employees turn the tables with a few measured conversations with the boss in question. The trick is to frame it as an attempt to be a better worker. "You might go directly to your boss and ask for feedback on your work and share how good you feel about the work you did," advises Adolf. Another option is to try the "let's give each other feedback" tactic. This applies only if you're working closely with your boss. "Many HR professionals encourage managers to seek feedback by saying such things as, 'What could I be doing to help you better achieve your goals?'" But an amenable tone is a must, especially in the workplace. "Present your ideas from your perspective," says Adolf. She gives this example: "I have been thinking that if you were to tell me more about the project in advance I could do a better job." If your gripes about the boss involve bigger issues, like harassment or fraudulence, you're better off going straight to HR. "First you might talk to someone you trust in HR and raise your concerns," says Adolf. "If it's a legal issue, be sure to have documentation and specific examples of why you think what your boss is doing is unlawful. Be clear about how such behavior puts the organization in danger, so you don't seem like just an individual complaining." A threat to the company as a whole is more likely to propel executives into action. The complaint: "I ordered the wrong item online." Online shopping goes hand in hand with surprise. No matter what that purse or shoe looked like on your laptop, it's going to be a different story in three dimensions. With large chain stores, size, color, and packaging are fairly standard, but small, independent retailers tend to have less uniformity in design and packaging. Plus, their return and exchange policies aren't always as clear-cut as big name brands. Handbag and home accessories designer Ryan Green fields her customer service issues directly. "Small stores and independent designers depend on repeat customers and word of mouth," says Green, owner ofwickedmint.etsy.com. "Almost all of us understand the importance of offering over-the-top customer service and will do whatever we can to resolve a complaint as long as it's within reason." That said, a little bit of sugar goes a long way. One recent customer emailed a complaint and led with a compliment. She wrote: 'I got one of your fantastic bags but am wondering if there's a way I could exchange it for one of the Plum Stallion bags?'" As the designer, payroll exec, and expediter, a hostile rant can really fray nerves. And in the same vein, a friendly request can go a long way. "I was so endeared by that request I went out of my way to hand deliver her a new bag and even tossed in a couple little extras," says Green. Some small retailers don't offer refunds but that doesn't mean you have to give up. "Be firm but offer options," she says. "Try something like: 'Thanks for your reply. I would really appreciate it if you'd accept this blue product in exchange for another color, or for a store credit.'" If the seller is unmoved, all is not lost. Try making up a new policy for the seller. Many are small enough to deal with complaints on a case-by-case basis. Green recalls another online retailer who negotiated an involved reimbursement after several conversations with the disgruntled customer. Asking the seller why he can't complete the return may lead you to come to a viable resolution together. The complaint: "I hate your style." The recipient: The boyfriend, Matt F.
Like a lot of guys, Matt's style wasn't his strength. And his ex-girlfriend wouldn't let him forget it. Several years ago the environmental attorney's weekend uniform was beer shirts and baseball caps. His ex wasn't the first woman to complain about it, but she was the first to make an impact. Her first move was to casually suggest shopping detours. "We started down the successful road by dodging into stores when we were already out," says Matt. "It wasn't like she made a big thing about it so there was no pressure." Her other clever tactic was to skip the pricey boutiques and take her man to thrift stores. "I could sort through racks for hours and only spend a few bucks." Low risk, high reward is definitely the way to a beer shirt guy's heart. Once Matt didn't cringe at the sight of a new shirt (however old it was), she brought along a female friend for the shopping outings. "I liked the attention I got from both of them in the store and they were always flattering, no matter what I put on," says Matt. "It was more of a way for me to think about clothing, and define my style, whereas before I had never given it much thought." Before long he was shopping at thrift stores once a week on his own. "It opened up an interest of my own in fashion," he says. But it may have backfired: "My new style ended up getting me more attention from women. I'm sure that was an unintended consequence for her." Some complaints have a higher calling.